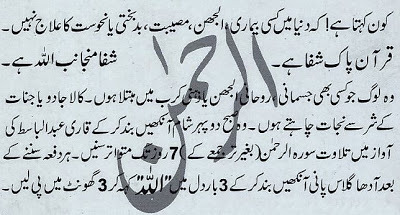 All those suffering from any Physical, Mental and Spiritual illness or black magic, should listen to Surah “Al-Rehman” a recitation by Qari Abdul Basit with out translation three time a day for seven consecutive days with closed eyes and full attentin. Every time after listening take half glass of water. Close eyes and say “Allah” thrice in heart and drink in three sips.